Did you know the President of the United States lives and works in a National Park? 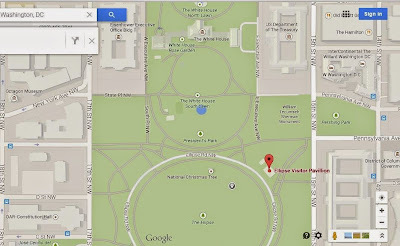 The White House grounds are called the President's Park and is approximately 82 acres. Touring the White House gardens and grounds only happens twice a year, one weekend in the spring and one weekend in the fall. 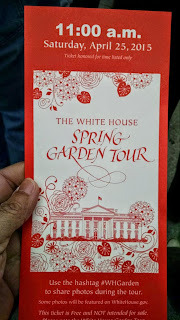 I was just lucky enough to get tickets for the Spring Garden Tour at the White House. The White House makes the tour announcement 1-2 weeks prior to the event. Tickets are free and they are handed out at the Ellipse visitor Pavilion each day of the tour starting at 9am. I highly suggest you arrive before 9am, the lines are huge and once the tickets are gone, they are gone. They are usually gone by 11am, if not sooner. Your entire party should be there but you could get an extra ticket for anybody in your group that is running late. Tickets are time stamped and they control the crowds inside the gardens by only allowing so many people per time window. We heard about 72,000 people visit the gardens per day. If you are there early enough, once at the ticket window you can request a time slot that is convenient for you, if available, otherwise, you will get tickets for whatever time is open. I requested and got 11:00am. As your allotted time approaches, find out which line is your time slot line. There will be plenty of people waiting at different locations depending on the time in their ticket. There will be National Park helpers that can tell you which is your line. While in line there are security dogs ensuring safety. You will be going through a check point that is very thorough so you want to follow the guidelines as stated in the White House website announcement for what not to bring. No food or beverages (liquids) of ANY kind or size. Regarding large backpacks and large purses, don't bring them, it just slows down the whole process but worse you may not be allowed in. They will not store it for you, so pack light. By the checkpoint they will separate people into lines of those with large purses versus small purses, and you can guess which line goes faster. Know that your cell phone will be scrutinized. Make sure you do read the announcement for restrictions on what not to bring. 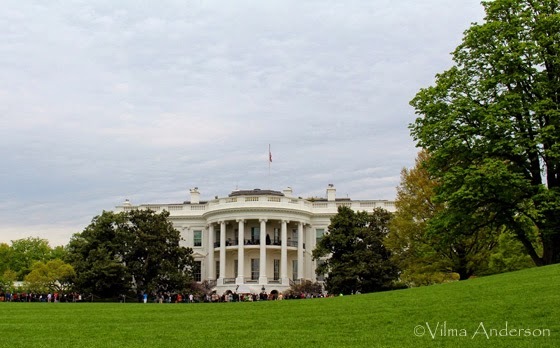 You start on the path toward the White House and along the way are easels displaying historical photos of the White House. The first garden you see is the Jacqueline Kennedy Garden and since you cannot go into it, you really cannot see it too well. Then comes the White House which when you are up that close it is quite a beautiful sight. 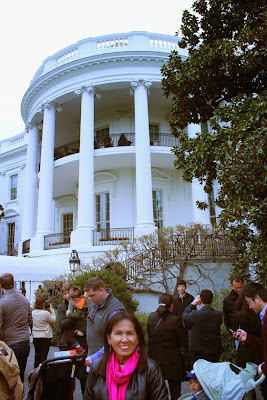 Notice the beautiful stairs, the balcony, the entrance at the lower level, and how white the White House really is. Everybody wants a photo in front of it so it gets crowded. After a while White House staff members will remind you to keep on going because there are many more people waiting in line to get in. Turning around you notice the beautiful view of the South lawn, the Washington Monument, and the Lincoln memorial in the distance. It is quite an awesome view. Next comes the Rose Garden but only the tulips were in bloom and how beautiful they were! 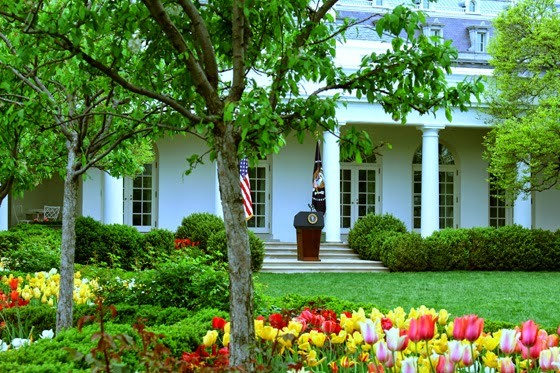 The Rose Garden is used by the President to do media events, pardoning of the turkey among others, and what a nice spot that is. Then you see the outside of the Oval Office which I could have missed, but I asked a security staff member as to what it was and I am glad I asked. There are large windows in the office although I wonder if the President ever gets the chance to look outside his windows. Right next to it, we noticed a kid's playground. The security guy said that President Obama had it installed for his daughters during his first term, so glad they could still be kids. 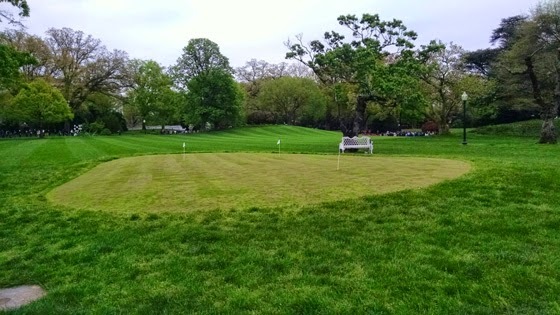 But of course, the funny thing is that opposite to the playground and the Oval Office there is a putting green. I asked if it ever gets used, I was told yes but it didn't sound to me like it is used often. After this you find yourself at the bottom of the hill, on the South lawn. Looking back you have a beautiful view of the White House and a photo opportunity. 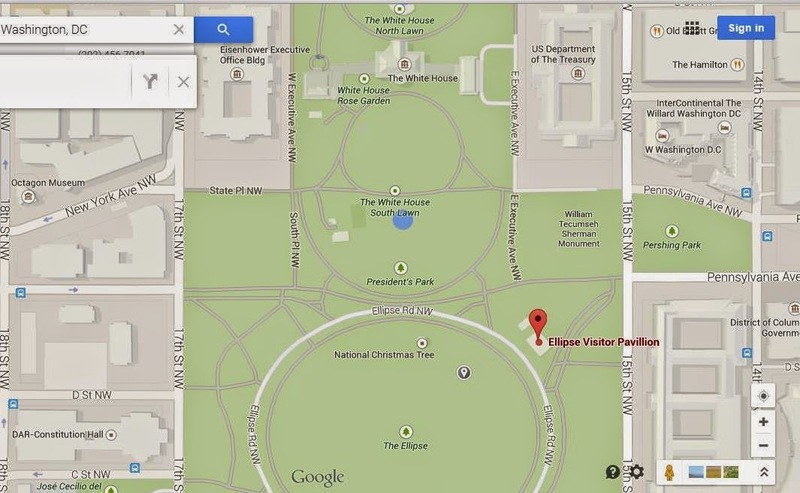 The other way is the view of the water fountain and the Washington Monument and Lincoln memorial. During this tour, the Marines were playing traditional patriotic tunes which was quite a treat. 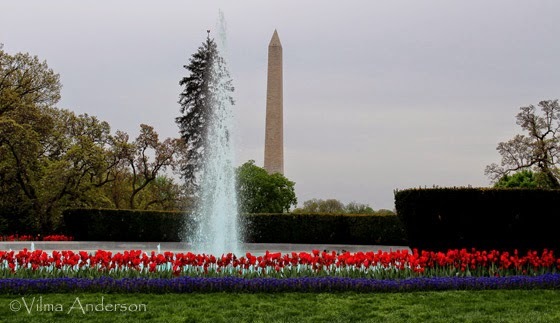 The White House fountain was surrounded by blooming red tulips which was a gorgeous sight. Pass the fountain is the vegetable garden established by Mrs. Obama. 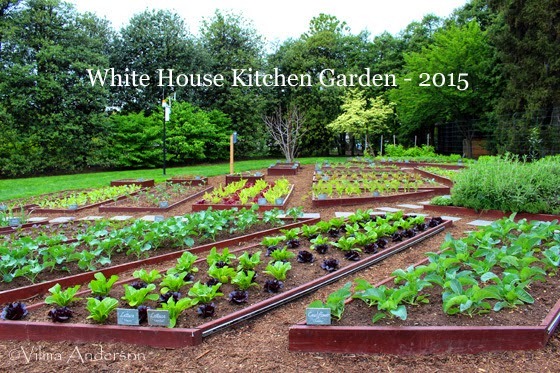 The White House Kitchen garden is quite large and very well taken care of. I am sure Mrs. Obama gets quite a bit of help. After that you pass the Children's garden established by Lady Bird Johnson but it was not open for viewing. The exit is shortly after that. Wanting to know more about the gardens after the tour, I did some reading on the web and here are some interesting facts. John Adams was the first president to establish a vegetable garden although I think it was torn down along the way. 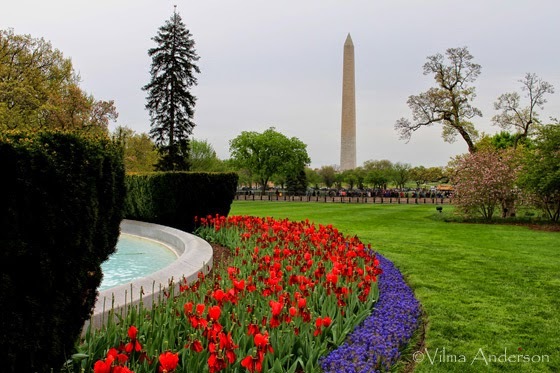 John Quincy Adams established the first flower garden and planted many ornamental trees. 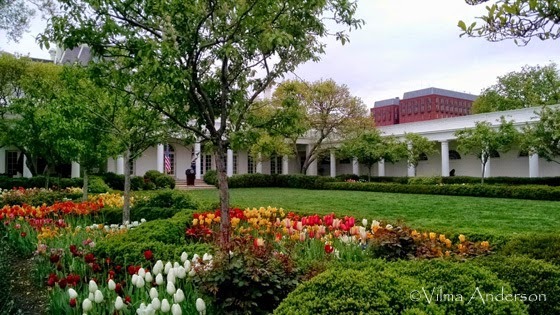 There are 13 regular White House staff and 12 National Park Service staff taking care of the grounds and gardens. The Rose Garden has had quite an evolution through the years. To see historical photos visit this website but realize that it is not the official White House website. 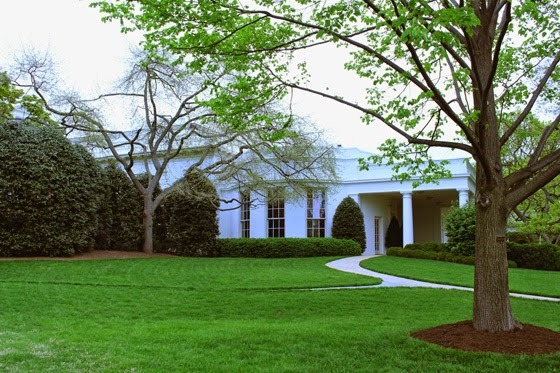 To see a historical timeline of the White House gardens, visit the White House Historical Association. Along the way, I learned about the war garden movement and Victory gardens that occurred during World War I & II. It was a government campaign promoting home gardens for Americans to grow their own fruits and vegetables so commercial crops could be used to feed the military overseas as well as people in the war zones where the farm fields had become battle zones. During World War II, in 1942, the United States introduced food rationing; Americans had great incentive to grow fruits and vegetables. During that time Eleanor Roosevelt planted a Victory garden in the White House lawn. By 1944, about 20 million people had planted victory gardens producing the equivalent of 40% of all the fresh fruits and vegetables consumed in the United States. That is amazing! If those fruits and vegetables in the Victory gardens had been grown the hydroponics way, I can assure you the production would have been much higher. I have personal experience growing tomatoes the hydroponics way. 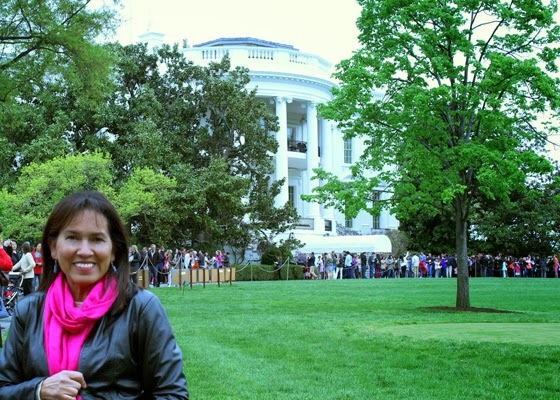 I also learned the White House grounds are more beautiful seeing them in person than on TV. 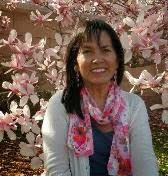 I will be in line for the fall garden tour, let's hope it is a nice sunny day. If you have any questions, let me know. 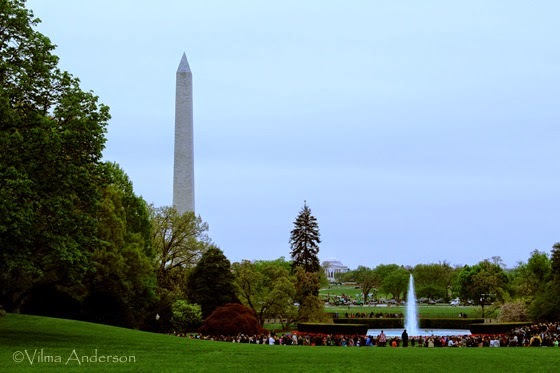 If traveling to Washington DC in the spring is in your future plans, you should read about our Kite Festival and the Cherry Blossom Festival. Please like and share this blog. Follow me in Google plus or sign up via email to receive future posts.